Brenton will present the premiere performance of Love, As We Know It, a work that will feature some of Melbourne’s finest musicians in a collaboration with US poet Christopher Poindexter. 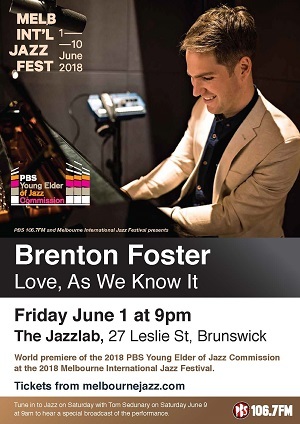 Love, As We Know It will be performed by Brenton Foster together with Stephen Magnusson, Jordan Tarento, Aaron McCoullough and Gideon Brazil, at The Jazzlab, Brunswick on Friday June 1 at 9pm as part of the 2018 Melbourne International Jazz Festival. Pianist and composer Brenton Foster is the winner of the 2018 PBS Young Elder of Jazz Commission. This is an annual PBS initiative promoting innovation and excellence in jazz composition.